Automated content generators that scrape/mash content together to make new articles. Spinning tools that promise to re-write any article in an intelligent way so you have 100% unique content without any manual re-writing. Auto generated content is never as good as hand written content. Using article spinners always results in spun articles that are a long way away from what can be considered “quality”. Auto generated content WILL NEVER BE good enough to beat out articles that are thoughtfully written out by a human. However, there is a way to use content generators to speed up our content creation AND have something usable at the end. Content generators are really good for finding relevant useful snippets of text. Imagine having 1,000 juicy snippets of content research in front of you to get inspired by. No matter what the promise, all article spinners struggle to produce readable re-writes if set to “automatic rewrites”. Spinners work better if you manually select synonyms. This is a semi automated method of content writing. 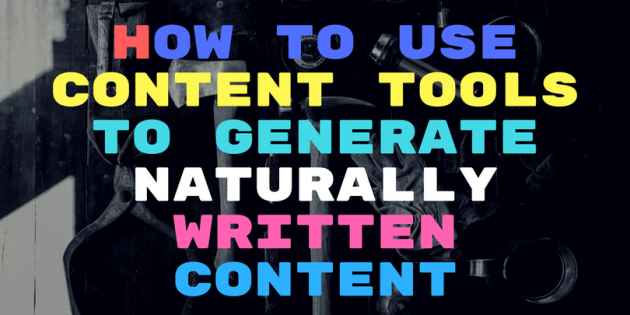 Load up your content generator, you want a tool that will scrape content for your keyword and give it to you as sentences. Filter your sentences manually using excel. Remove sentences that mention any words that you think are junk or spammy. With the sentences that are left, you need to start mentally grouping them into topic groups. Topics are generally words that appear frequently in sentences. Decide on the topics you want to use. Find sentences that mention your topic and use them as the research to create a new paragraph of content. If you are going to use research verbatim, you need to re-write it manually using both a spinner and using your brain. You want any content you write to be 100% unique. What is unique? Based on how Copyscape works, you need to re-write and change every 3rd word in your sentence for the sentence to be “unique”. Pick a title for your next article. Article Insights will analyse the search results to find the top 25 most popular keywords for your article. The related keywords list tells you exactly the kind of words/terms that ranking articles are using. You want to mirror this by using the same kind of terms and words they use. Some keywords you may not even have thought about using! Congratulations, you have just found a way to increase the value of the article to your readers… and you give Google a better hint on how it should rank it. Related keywords themselves should be grouped into article topics. The first topic contains the words “paper, pad, pen”. If you click on the “Show Content Research” button you will discover that a common topic is to talk about using paper/pads in the pen to start toilet training your puppy. There are many other topics you can use as well. It’s not a fully automated content tool, but now you got a starting base for your article instead of a white page with just an article title in bold.